I have truly never seen the appeal of golf, but Golf Story, a new Nintendo Switch exclusive, is so charming that I can’t stop playing it. I’m not a sports hater, but golf really isn’t my thing. If I wanted to take a long walk, I’d just take a long walk, ya dig? Golf Story, out today on the Nintendo Switch, isn’t the video game equivalent of a pleasant afternoon stroll, but it does flip some of the accepted conventions of golf on its head. Rather than wealthy men wearing plaid, this is game is a sweet underdog tale. In it, you play as a young man who is taking one last chance at his unlikely dream of being a professional golfer. He’s up against reluctant coaches, an underhanded boss and an underfunded, unkempt course, but by gum he’s going to do it. 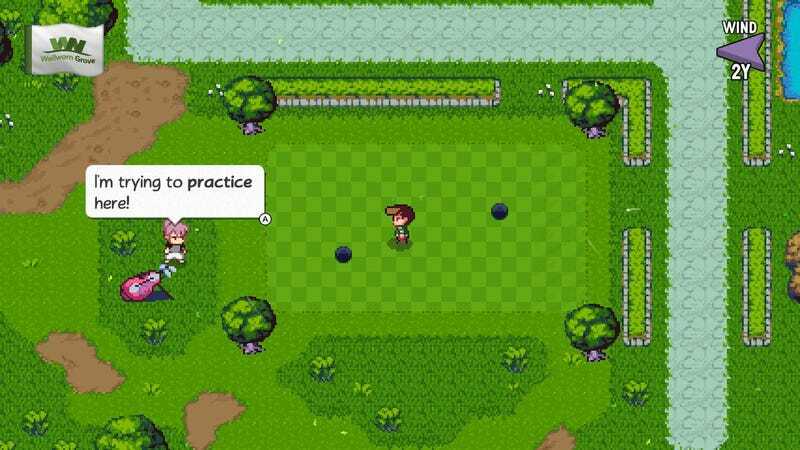 Golf Story seems more RPG than sports game. There is a lot of talking in this game. Before you can start golfing, you have to complete a series of challenges that will not only teach you how the game works, but level up your character. You’ll be running around Wellworn Grove, your golf course of choice, looking for NPCs to show you the ropes. It all feels a little bit like the beginning of a JRPG where you meet your rivals, love interest, and the big bad you’ll eventually defeat, all in the first town. Before you start your first real game of golf, you’ll have met Coach, your would be mentor, Lara, a headstrong young woman hates you, and Lucky, the exploitative owner of Wellworn Grove. Even if your golf is often interrupted by a conversation, the writing is charming and funny. Your initial rivals include a guy who starts every sentence with, “If I may interject—” and I’m really surprised that Golf Story figured out the magic formula to getting me to hate someone very quickly. After all that well, it’s golf. While it’s cool that I’m learning a bunch of new golf words—now that I have gotten both a Birdie and an Eagle on a course, I suddenly get that terminology—Golf Story’s golf is video game-y in the best way. You set up your shots, and then try to press A when the moving bar hits the appropriate spot in the meter. There’s also fun, silly obstacles. In your very first game, the final hole will be interrupted by a rampaging goose, and later courses will be dotted with devious moles that move your ball into the rough or sandpits if they land too close. These touches spice up the game and are also, well, pretty funny. Every time I hit my ball within a mole’s grasp I’d mutter “goddammit,” but their borderline sinister animation was still a treat. Realistic golfing simulator this is not, but I think I like this better. The courses are just short enough that I find myself picking my Switch up to do just one more hole, and challenging enough that I feel pretty accomplished when I make it under par. I’m still unlikely to pick up a club in real life, but Golf Story’s charms have made me think maybe, just maybe, the sport isn’t so bad after all.